There is no phrase that I hate more than to "think outside the box." The saying is so unoriginal, that using it completely negates the entire idea. Is there not a more creative way to say "Be creative" ? But what happens when creative borders on crazy? This cake just might be the answer. I'll admit, I got a little carried away with this cake. When you make cake after cake, sometimes you just got to flex your creative muscles and throw together something totally out of the ordinary (or at least what is ordinary to you.) Sometimes I just have to get it out of my system and hope for the best. In a way, I gathered up a few different things I've been wanting to try out and threw them back onto one cake. Some may think of it as a total mess - incomprehensibly tossed together. I like to think of it as art. And as we all know, art can't be wrong - right? Haha. There is definitely a trend going on down-under. Australian bakers are all about the abstract these days, and it is definitely spreading world-wide. From cake makers like Katherine Sabbath and Nikki Lee of UnBirthday, to all the Cakes by Cliff, their one-of-a-kind creations are dripping with technicolor glazes, meringue and sugar sculptures, and vibrant edible flowers and candies. Each of their cakes are unique and more over-the-top than the next. You might think the end product would be a total disaster by my description, but I think they are gorgeous! This cake was definitely inspired by these pastry "artists." 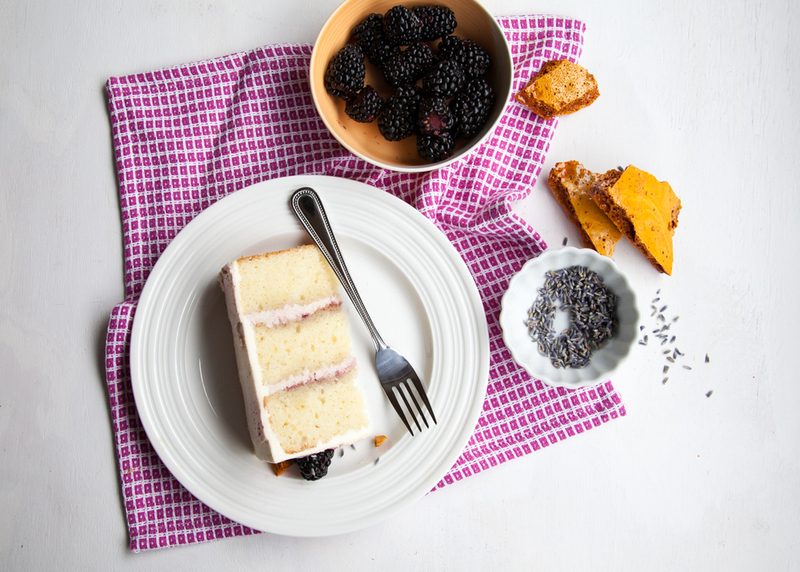 This Lavender Blackberry Cake has a bit of everything going on. From the watercolour frosting to the abstract shards of honeycomb, it's pretty far from your typical yellow birthday cake with fudge frosting. Since I was going for a more contemporary, artsy vibe - the rustic, watercolour frosting seemed like a great place to start. I wanted to create a flavourful blackberry frosting, but was struggling to mix in enough of the blackberry to get the flavor I wanted before the frosting became un-frostable (yes, I think I just made up a word, but stick with me). Instead on creating a smooth icing finish, I gave the cake a thin layer of buttercream before swirling on the blackberry frosting on top in a spackel-like fashion. The outside actually mimics the filling layers - where I created a blackberry ripple of cream cheese frosting and blackberry preserves. Instead of trying to force enough of the blackberry into the cream cheese before it curdled, I placed a few dollops on top and gave it a big swirl with an offset spatula to create a ripple of berry goodness. I've been wanting to make homemade honeycomb for a while now, and felt inspired to use shards of the hand-broken candy to top my cake. I love the added crunch it gives to each bite, the subtle honey taste, and the beautiful golden color made the finished cake POP. I off-sett the honeycomb with fresh blackberries, culinary lavender, and called it a day. Head on over to Brit + Co. for the recipe and full step-by-step tutorial!